Continent-shifting cataclysms have been a mainstay in fantasy literature since the 1920s, epic fantasy in particular. It’s a curious thread. After all, human history is such a miniscule portion of geological time that while we’ve seen coastlines shifts or islands rise and sink, we haven’t seen significant alterations of any one landmass since the Stone Age. Continental drift will, by necessity, rarely affect a story or the characters except in the broadest sense. Yet massive geological shifts stay simmering in the foundational works of the modern fantasy genre. 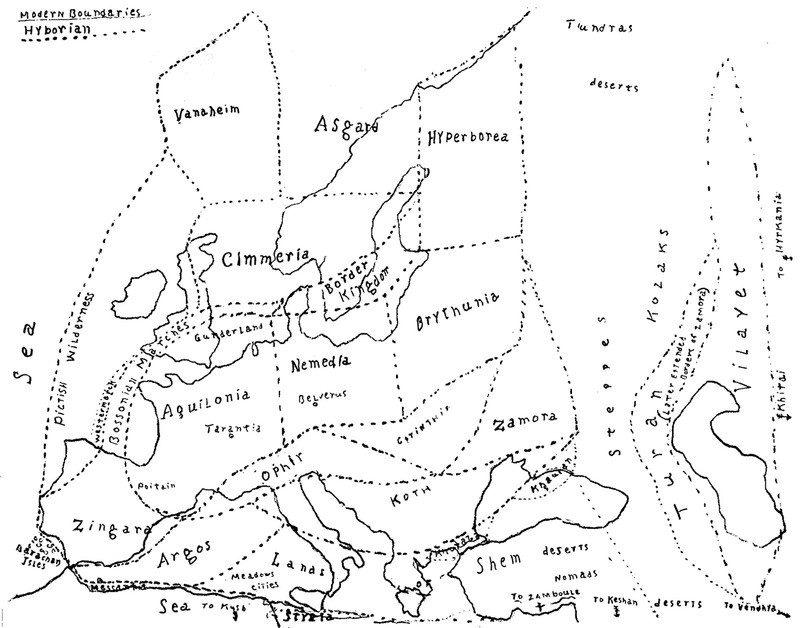 Robert E. Howard’s Hyborian Age, while ostensibly set in our prehistory, has a significantly different-looking map of what would become Europe, the Middle East and Africa. "The Thing in the Crypt": The Interactive Adventure Game! L. Sprague de Camp’s attempts to usurp Conan’s legacy are fairly well known among fans of Robert E. Howard. I’m not sure if you could find a poorer fit for Conan than de Camp: Howard was a serious writer who often wrote about the inevitable downfall of civilization; when de Camp turned his pen to sword & sorcery, he often wrote jokey tales of western triumphalism. The two men had diametrically opposite worldviews, and took very different approaches to writing. De Camp’s attempts to “correct” the Conan stories by adding in a healthy dose of ancillary material with the help of his co-conspirator Lin Carter smacks of hubris and, more importantly, doesn’t work all that well. The first story you encounter when reading the de Camp-edited Lancer paperbacks is not “The Tower of the Elephant” but a pastiche story by de Camp and Lin Carter, because, well, obviously your first exposure to Conan shouldn’t be via the inferior Robert E. Howard. As an introduction to Howard’s Conan, “The Thing in the Crypt” is highly unsuitable. This Conan acts little like Howard’s, something born out in every pastiche tale by the duo. De Camp & Carter’s Conan solves his problems by rational thought (and even knowledge of biology or physics!) instead of intuition and action. There are few deeper themes, and the writing is incredibly bland. Looking over these stories again, I can’t help but notice how much they play out like adventure games. There are token one-use items, a hero who must triumph by brains rather than brawn, and most of all…there are puzzles. “The Thing in the Crypt” is the most adventure game-like of them all: there are no characters beyond a virtually personality-less young Conan, there’s an underground setting, items to combine and use, an obstacle to overcome through use of the aforesaid items in order to gain another item. It reads like a detour in Zork or King’s Quest. I can’t help but feel that de Camp might have done better to get a job at Infocom. I once took a course in Popular Fiction at university, and it was inevitable that we were eventually going to hit the pulp era at some point. I’ve always had a soft spot for pulp era fantasy (the “weird tale”), especially the Big Three: Robert E. Howard, Clark Ashton Smith and H.P. Lovecraft. As you might expect, we did talk about Lovecraft in relation to the birth of popular Horror, but didn’t talk at all about Howard and Smith–for me, Lovecraft comes in a distant third in terms of writing quality, but his influence has been without a doubt the greatest among them. I struggled to really explain my love for the old pulp beyond “adventure and excitement” until I took a good look at the pulp phenomenon. A lot of the material found in Hard-Boiled: Working Class Readers and Pulp Magazines by Erin A. Smith applies just as well to Weird Tales and Argosy as to Black Mask. The pulps exploited low production costs thanks to industrialization and rising literacy rates among the urban working class to create literature for the marginalized. There was no top-down structure in pulps for feeding lower classes middle-class values—the audience dictated content. And who was the audience? “[T]heir readers were widely held to be socially and economically marginal…[t]hey were working-class, young, and poorly-educated, many were immigrants” (Smith 23) Well gosh, that actually sounds like my background and the situation of those around me as a young immigrant in Canada!